孟繁昊, 高聚林, 于晓芳, 王志刚, 胡树平, 青格尔, 孙继颖, 屈佳伟. 生物炭配施氮肥改善表层土壤生物化学性状研究[J]. 植物营养与肥料学报, 2018, 24(5): 1214-1226. MENG Fan-hao, GAO Ju-lin, YU Xiao-fang, WANG Zhi-gang, HU Shu-ping, QING Ge-er, SUN Ji-ying, QU Jia-wei. Inprovent of biochemical property of surface soil by combined application of biochar with nitrogen fertilizer[J]. Journal of Plant Nutrition and Fertilizers, 2018, 24(5): 1214-1226. Abstract: 【Objectives】 The objectives of this study were to investigate the influence of combined application of biochar with nitrogen (N) fertilizer on soil carbon and nitrogen, biological property and spring maize yield, to elucidate the changing rule of soil carbon (C) and N content and the biological character by combined application of biochar with N fertilizer, providing a scientific basis for reasonable fertilization, improving soil environment and increasing spring maize yield. 【Methods】 Field experiments were conducted in the west (Baotou) and east (Tongliao) region of Inner Mongolia. There were four biochar rates as 0, 8, 16, 24 t/hm2 (expressed as C0, C8, C16, C24, respectively) and three N rates of 0, 150, 300 kg/hm2 (expressed as N0, N150, N300, respectively). Soil C, N content, microbial biomass and enzyme activity of three soil layers (0–10 cm, 10–20 cm and 20–40 cm) and maize yield were tested at harvest. 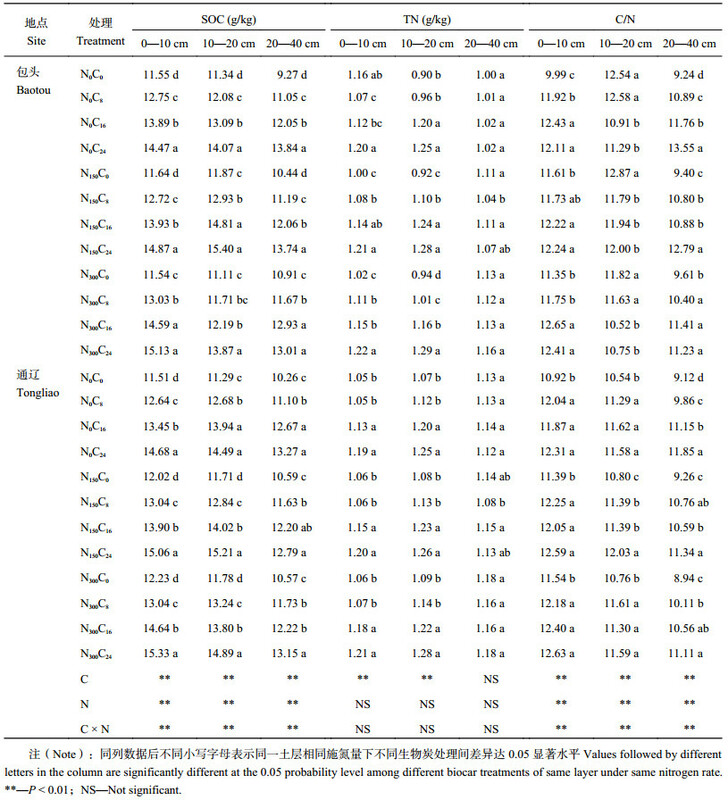 【Results】 Biochar and N fertilizer application significantly affected the organic carbon, C/N ratio, microorganism quantity and enzyme activity of 0–10 cm, 10–20 cm and 20–40 cm soil layers (P < 0.01), and their interaction was also significant in two experimental sites. With the increase of biochar application rate, organic C in three soil layers and total N in 0–10 cm and 10–20 cm soil layers were gradually increased in two sites. Applying biochar and N fertilizer could significantly improve microbial biomass C, microbial biomass N, sucrase activity, urease activity, catalase activity, total enzyme activity index in the three soil layers, and had the trend of increase first, then decrease with the increase of biochar and N application rates. 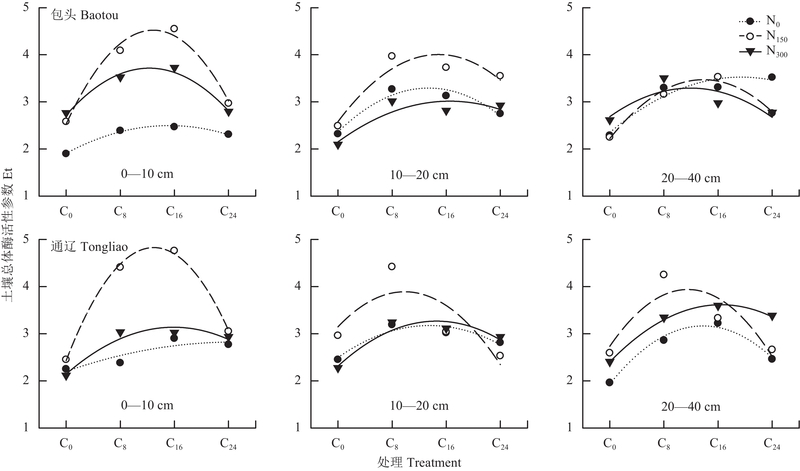 The microbial biomass C, microbial biomass N and sucrose enzyme and urease activity in the 0–10 cm and 10–20 cm soil layers were significantly higher than those in the 20–40 cm soil layer. 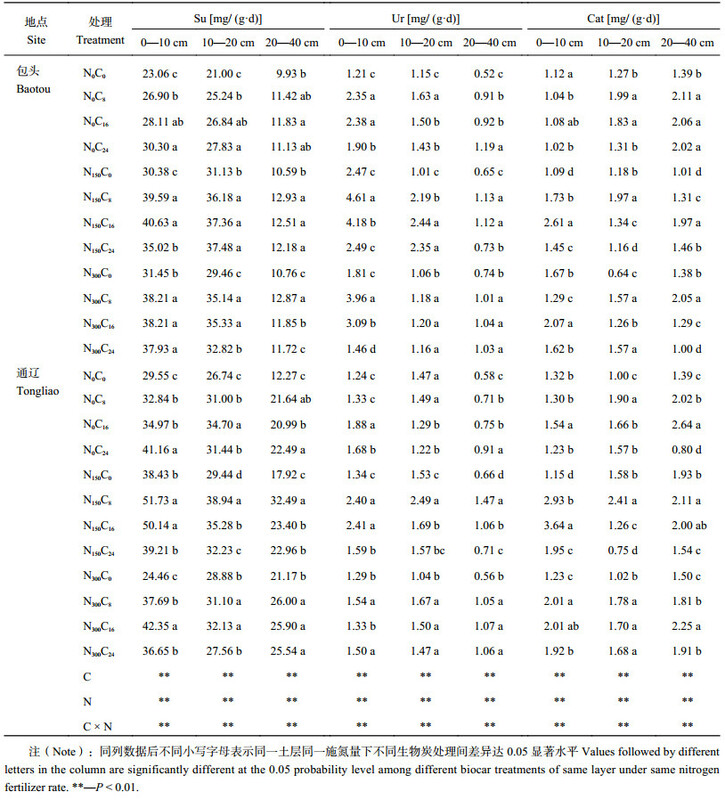 N fertilizer and biochar could significantly increase grain number per cob, 100-seed weight and the yield of spring maize in Baotou and Tongliao. The maximum yield of 15.51 t/hm 2 and 16.43 t/hm2 in Baotou and Tongliao, respectively, was from the treatment of C8N150. According to the correlation analysis, spring maize yield was mainly related to the microbial biomass and enzyme activity in 0–10 cm and 10–20 cm soil layers. 【Conclusions】 The appropriate rate of biochar combined with N fertilizer could increase the soil carbon and nitrogen reserves, microbial biomass and enzyme activity in Inner Mongolia, improve the soil micro-ecological environment, and finally increase the yield of spring maize. Combined application of biochar and N fertilizer could improve soil fertility and reduce chemical fertilizer input. From this experiment, the optimal combination was 8 t/hm2 of biochar and 150 kg/hm2 of N fertilizer. 注（Note）：同列数据后不同小写字母表示同一土层相同施氮量下不同生物炭处理间差异达 0.05 显著水平 Values followed by different letters in the column are significantly different at the 0.05 probability level among different biocar treatments of same layer under same nitrogen rate. **—P < 0.01；NS—Not significant. 注（Note）：同列数据后不同小写字母表示同一土层同一施氮量下不同生物炭处理间差异达 0.05 显著水平 Values followed by different letters in the column are significantly different at the 0.05 probability level among different biocar treatments of same layer under same nitrogen fertilizer rate. **—P < 0.01. 注（Note）：*—P < 0.05; **— P < 0.01. 注（Note）：同列数据后不同小写字母表示同一施氮量下不同生物炭处理间差异达 0.05 显著水平 Values within a column followed by different letters are significantly different at the 0.05 probability level among different biocar treatments under same nitrogen fertilizer rate. *—P < 0.05；**— P < 0.01；NS—Not significant. 注（Note）：*—P < 0.05；**— P < 0.01. Jr M J A, Gronli M. The art, science and technology of charcoal production[J]. Industrial & Engineering Chemistry Research, 2003, 42(8): 1619–1640. 陈温福, 张伟明, 孟军. 农用生物炭研究进展与前景[J]. 中国农业科学, 2013, 46(16): 3324–3333. Braida W J, Pignatello J J, Lu Y, et al. Sorption hysteresis of benzene in charcoal particles[J]. Environmental Science & Technology, 2003, 37(2): 409–417. Kleiner K. The bright prospect of biochar[J]. Nature Reports: Climate Change, 2009, 3(6): 72–74. 张爱平, 刘汝亮, 高霁, 等. 生物炭对宁夏引黄灌区水稻产量及氮素利用率的影响[J]. 植物营养与肥料学报, 2015, 21(5): 1352–1360. Zhang A P, Liu R L, Gao Q, et al. Effects of biochar on rice yield and nitrogen use efficiency in the Ningxia Yellow River irrigation region[J]. Journal of Plant Nutrition and Fertilizer, 2015, 21(5): 1352–1360. Zwieten L V, Kimber S, Morris S, et al. Effects of biochar from slow pyrolysis of papermill waste on agronomic performance and soil fertility[J]. Plant & Soil, 2010, 327(1-2): 235–246. Robertso F A, Thorbum P J. Management of sugarcane harvest residues: consequences for soil carbon and nitrogen[J]. Australian Joumal of Soil Research, 2006, 45(1): 13–23. Steiner C, Teixeira W G, Lehmann J, et al. Long term effects of manure, charcoal and mineral: fertilization on crop production and fertility on a highly weathered central amazonian upland soil[J]. Plant & Soil, 2007, 291: 275–290. 宋大利, 习向银, 黄绍敏, 等. 秸秆生物炭配施氮肥对潮土土壤碳氮含量及作物产量的影响[J]. 植物营养与肥料学报, 2017, 23(2): 369–379. Song D L, Xi X Y, Huang S M, et al. Effects of combined application of straw biochar and nitrogen on soil carbon and nitrogen contents and crop yields in a fluvo-aquic soil[J]. Journal of Plant Nutrition and Fertilizer, 2017, 23(2): 369–379. Lehmann J, Gaunt J, Rondon M. Biochar sequestration in terrestrial ecosystems—A review[J]. Mitigation & Adaptation Strategies for Global Change, 2006, 11(2): 395–419. 高德才, 刘强, 张玉平, 等. 添加生物黑炭对玉米产量、品质、肥料利用率及氮磷径流损失的影响[J]. 中国土壤与肥料, 2015, (5): 72–76. Gao D C, Liu Q, Zhang Y P, et al. Effects of adding biochar on yield, quality, fertilizer utilization of summer maize and nitrogen and phosphorus runoff losses from field[J]. Soil and Fertilizer Sciences in China, 2015, (5): 72–76. 高德才, 张蕾, 刘强, 等. 生物黑炭对旱地土壤CO2、CH4、N2O排放及其环境效益的影响 [J]. 生态学报, 2015, 35(11): 3615–3624. Gao D C, Zhang L, Liu Q, et al. Effects of biochar on CO2, CH4, N2O emission and its environmental benefits in dryland soil [J]. Acta Ecologica Sinica, 2015, 35(11): 3615–3624. Uzoma K C, Inoue M, Andry H, et al. Effect of cow manure biochar on maize productivity under sandy soil condition[J]. Soil Use & Management, 2011, 27(2): 205–212. 尚杰, 耿增超, 陈心想, 等. 生物炭对土壤酶活性和糜子产量的影响[J]. 干旱地区农业研究, 2015, 33(2): 146–158. Shang J, Geng Z C, Chen X X, et al. Effects of biochar on soil enzyme activities and millet yield[J]. Agricultural Research in the Arid Areas, 2015, 33(2): 146–158. 黄巧云, 林启美, 徐建明. 土壤生物化学[M]. 北京: 高等教育出版社, 2015. Huang Q Y, Lin Q M, Xu J M. Soil biochemistry[M]. Beijing: Higher Education Press, 2015. 鲍士旦. 土壤农化分析[M]. 北京: 中国农业出版社, 2003. Bao S D. Soil and agricultural chemistry analysis[M]. Beijing: China Agriculture Press, 2003. 吴金水, 林启美. 土壤微生物生物量测定方法及其应用[M]. 北京: 气象出版社, 2006. Wu J X, Lin Q M. Determination of soil microbial biomass and its application[M]. Beijing: China Meteorological Press, 2006. 关松荫. 土壤酶及其研究法[M]. 北京: 农业出版社, 1987. Guan S Y. Soil enzymes and their research methods[M]. Beijing: Agriculture Press, 1987. 何文祥, 谭向平, 王旭东, 等. 土壤总体酶活性指标的初步研究[J]. 土壤学报, 2010, 47(6): 1232–1236. He W X, Tan X P, Wang X D, et al. Preliminary study on the soil total enzyme activity index[J]. Acta Pedologica Sinica, 2010, 47(6): 1232–1236. 张旭东, 梁超, 诸葛玉平, 等. 黑碳在土壤有机碳生物地球化学循环中的作用[J]. 土壤通报, 2003, 34: 349–355. Sohi S, Lopez-Capel E, Krull E, Bol R. Biochar, climate change and soil: A review to guide future research [R]. CSIRO Land and Water Science Report, 2009: 1–56. Lehmann J, Silva J P D, Steiner C, et al. Nutrient availability and leaching in an archaeological anthrosol and a ferralsol of the Central Amazon basin: fertilizer, manure and charcoal amendments[J]. Plant & Soil, 2003, 249(2): 343–357. 高德才, 张蕾, 刘强, 等. 不同施肥模式对旱地土壤氮素径流流失的影响[J]. 水土保持学报, 2014, 28(3): 209–213. Gao D C, Zhang L, Liu Q, et al. Effects of different fertilization modes on soil nitrogen runoff in dryland field[J]. Journal of Soil and Water Conservation, 2014, 28(3): 209–213. 高德才, 张蕾, 刘强, 等. 旱地土壤施用生物炭减少土壤氮损失及提高氮素利用率[J]. 农业工程学报, 2014, 30(6): 54–61. Downie A, Crosky A, Munroe P. Physical properties of biochar[M]. London: Earthscan, 2009. 刘小虎, 赖鸿雁, 韩晓日, 等. 炭基缓释花生专用肥对花生产量和土壤养分的影响[J]. 土壤通报, 2013, 44(3): 698–702. Liu X H, Lai H Y, Han X R, et al. Effects of charcoal-based solow release peanut specific fertilizer application on peanut yield and soil nutrients[J]. 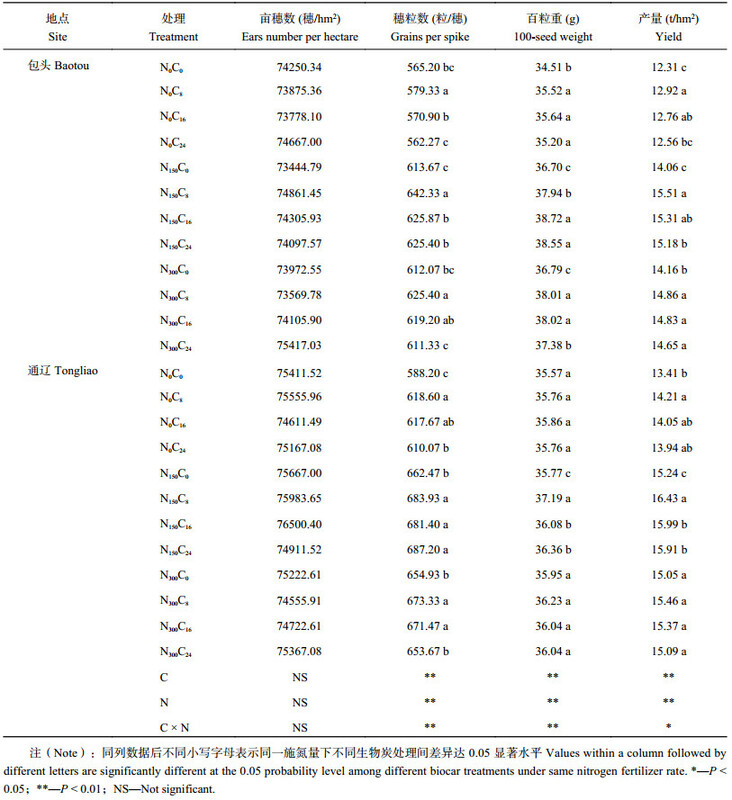 Chinese Journal of Soil Science, 2013, 44(3): 698–702. Ogawa M. Symbiosis of people and nature in the tropics[J]. Farming in Japan, 1994, 128: 10–34. 陈心想, 耿增超, 王森, 等. 施用生物炭后土土壤微生物及酶活性变化特征[J]. 农业环境科学学报, 2014, 33(4): 751–758. Chen X X, Geng Z C, Wang S, et al. Effects of biochar amendment on microbial biomass and enzyme activities in loess soil[J]. Journal of Agro-Environment Science, 2014, 33(4): 751–758. 顾美英, 葛春辉, 马海刚, 等. 生物炭对新疆沙土微生物区系及土壤酶活性的影响[J]. 干旱地区农业研究, 2016, 34(4): 225–230. Gu M Y, Ge C H, Ma H G, et al. Effects of biochar application amount on microbial flora and soil enzyme activities in sandy soil of Xinjiang[J]. Agricultural Research in the Arid Areas, 2016, 34(4): 225–230. 郭俊娒, 姜慧敏, 张建峰, 等. 玉米秸秆炭还田对黑土土壤肥力特性和氮素农学效应的影响[J]. 植物营养与肥料学报, 2014, 33(4): 751–758. Guo J M, Jiang H M, Zhang J F, et al. Effects of biochar amendment on microbial biomass and enzyme activities in loess soil[J]. Journal of Plant Nutrition and Fertilizer, 2014, 33(4): 751–758. 尚杰, 耿增超, 陈心想, 等. 施用生物炭对旱作农田土壤有机碳、氮及其组分的影响[J]. 农业环境科学学报, 2015, 34(3): 509–517. Shang J, Geng Z C, Chen X X, et al. Effects of biochar on soil organic carbon and nitrogen and their fractions in a rainfed farmland[J]. Journal of Agro-Environment Science, 2015, 34(3): 509–517. 袁晶晶, 同延安, 卢绍辉, 等. 生物炭与氮肥配施对土壤肥力及红枣产量、品质的影响[J]. 植物营养与肥料学报, 2017, 23(2): 468–475. Yuan J J, Tong Y A, Lu S H, et al. Effects of biochar and nitrogen fertilizer application on soil fertility and jujube yield and quality[J]. Journal of Plant Nutrition and Fertilizer, 2017, 23(2): 468–475. Topoliantz S, Ponge J F, Ballof S. Manioc peel and charcoal: a potential organic amendment for sustainable soil fertility in the tropics[J]. Biology & Fertility of Soils, 2005, 41(1): 15–21. Glaser B, Lehmann J, Zech W. Ameliorating physical and chemical properties of highly weathered soils in the tropics with charcoal: A review[J]. Biology & Fertility of Soils, 2002, 35(4): 219–230. Major J, Rondon M, Molina D, et al. Maize yield and nutrition during 4 years after biochar application to a Colombian savanna oxisol[J]. Plant & Soil, 2010, 333(1-2): 117–128.